Marchant's Foods, Inc. is a state inspected meat processing plant. We are also HACCP certified. 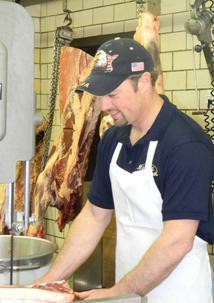 We produce high quality cuts of pork, hams, beef, sausages and many specialty cuts of meat. The meat department butchers weekly, on Tuesdays. Please call in advance to schedule an appointment to have your animal slaughtered. Animals scheduled for butcher should be delivered on Monday between the hours of 8:00 a.m. and 4:00 p.m. Arrangements can also be made for your animal to be picked up by us. We also offer venison processing. However, due to the recent CWD threat, all meat must be boneless & hairless. The tag must be shown at the time of delivery to prove the deer is legal. Please call for more details. Marchant's Foods has in-house smoking. Smoking time is about two to three weeks. Please call for current pricing for any custom smoking or processing. Due to the changing economy, all prices are subject to change. Pricing at the time your order is placed will apply. Due to the recent economy, butchering prices will vary. 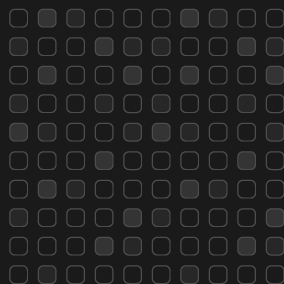 Feel free to call at any time to get a quote on current pricing. 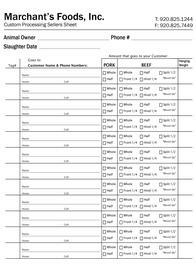 Animal sellers can print off a seller sheet from below to track their buyers. Beef is hung 7-10 days and pork is hung 2-3 days. Call or fax in your cutting instructions (see below) the week your animal is brought in or call to make an appointment to be here in person while we cut your animal. Beef is typically cut on Wednesday and Thursday, and pork on Friday. Appointments are available from 8:00 a.m. to 2:00 p.m. if you are interested in being here while it is being cut. 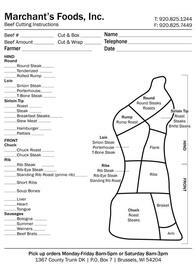 When your order is complete, you will recieve a phone call letting you know you can pick up your meat. Pick up hours are Monday thru Friday 8:00 a.m. to 6:00 p.m. and Saturday 8:00 a.m. to 5:00 p.m. 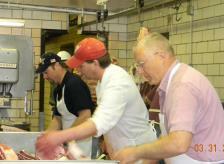 When you come for your order, simply come to the meat counter and let them know you are picking up your order. You will recieve your meat slip reciept and given instructions on where to park to load your car. If possible, bring coolers, laundry baskets or boxes for your meat. Boxes are available upon request. CANCELLATIONS: Please call us as soon as possible when cancelling or re-scheduling an animal for butchering, pick-up, delivery or appointments. To best serve you, we like to provide you with the most information possible about your purchase. You can get a whole, half, or quarter of beef or pork. 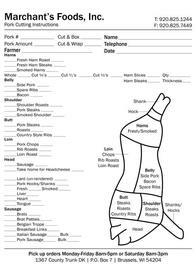 To help in that process, you can find cutting instruction sheets below. 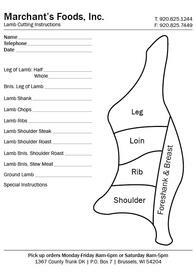 Beef, pork and lamb are available. Click on the image of the cutting sheet for a full page version and to print. If you have any questions while filling this out, give us a call at (920)-825-1244. When you have completed your instructions, feel free to drop it off at the store, or fax it to us as (920)-825-7449. You will be called upon completion of your order. If possible, bring coolers, laundry baskets or boxes for your meat. Boxes are available upon request. You are responsible for picking up any smoked hams or bacon.